Have you planned a trip with your family and been turned back around at the Canadian port of entry due to your past criminal record? You can be denied entry to Canada for many reasons ranging from minor to major offences such as DUI, misdemeanor, felony, health reasons, theft charge etc. It can be very frustrating being turned back and not knowing what you need to do to overcome your inadmissibility issue to Canada. To avoid facing problems at the Canadian border it is recommended to contact an immigration expert that can advise you on the best options available to you to have a successful entry into Canada. Akrami and Associates has assisted many clients with inadmissibility issue to Canada and we can certainly help you too. In this blog, you will get a basic understanding what you need to obtain prior to booking your flight or travelling with a car with criminal inadmissibility. Temporary Resident Permit also known as the TRP is a document that allows you for temporary entry into Canada. This document is only for persons that have an inadmissibility issue to Canada such as theft charge, DUI, DWI, felony, misdemeanor, health issues that can be a threat to Canadian citizens, misrepresented themselves etc. No matter how long ago the offense occurred you would have to obtain the proper document to overcome your past criminal record. The TRP is not guaranteed to be issued by the immigration officer at the border; they take into account the circumstance and your purpose of visit to Canada. Therefore, it is recommended to consult with an immigration expert to determine your chances of success prior to planning your trip to Canada. One of the main requirements to obtain a Temporary Resident Permit is that you have to convince the immigration officer you have a valid reason to enter Canada and assure him/her of your intention to leave after completion of the purpose of your visit. The officer will make sure that you do not pose a risk to Canada and its citizens. To determine you are not a risk to Canadian citizens the officer will look for supporting documents that can show you are better person and are making better choices in life. For example, if you were charged with a DUI, the immigration officer will look for reference letters from friends and family members that can attest that you are better person and have become more responsible. Having a character reference letter written by yourself will greatly support your application. The letter can include a story line of what happened and what changes you have brought in your life to be granted the TRP. The applicant for a Temporary Resident Permit can apply in their own country for a non-refundable fee of $200. If you decide to leave Canada while on a Temporary Resident Permit before the expiration of the duration of your stay, then you cannot re-enter, and will have to apply for a new permit. If you come from a non-visa exempt country and have an inadmissibility issue you would have to apply for an additional document called the Temporary Resident Visa (TRV) and have to include all the supporting documents to demonstrate to the officer your intension to Canada are only temporarily and will exit Canada once your visa expires. To be rehabilitated means to have the grounds of inadmissibility taken out from your criminal record. You can once again enjoy a constant steady way of life, and there is no possibility you will commit an offence again. Criminal rehabilitation is for people who have committed an offence outside Canada. If sufficient amount of time has passed since the applicant’s conviction then a criminal rehabilitation application will make the applicant admissible into Canada. Unlike the Temporary Resident Permit (TRP), Criminal Rehabilitation is a more permanent solution whereby the applicant’s criminal record is cleared out if the application is approved by the consulate of Canada. No matter how minor or major your offence, if it is a summary or an indictable conviction, or if it is a felony or a misdemeanor respectively an application for criminal rehabilitation will erase your criminal record. To have successful criminal rehabilitation application the immigration officer will have to consider how long ago you committed the crime and your behavior since the crime. You have to convince the immigration officer that you have been deemed rehabilitated. You may be deemed rehabilitated, if ten years have passed since your offence and on completion of your sentence and if the offence is one that would be in Canada an indictable offence punishable by a maximum of ten years’ incarceration or less. If the offence is one that would be prosecuted in Canada by the way of summary conviction and you have two or more charges of similar offences the period of rehabilitation is at least five years after the sentence imposed. It is recommended to consult with an immigration expert prior to submitting and criminal rehabilitation application so that they can review your case and see if you are eligible for criminal rehabilitation or if you have to apply for another document. Why do you consider to be rehabilitated? Have you gone to a drug rehabilitation or done community service? The application for Criminal rehabilitation will take approximately one year. For serious offences the Minister for Citizenship and Immigration will make a decision. For less serious offences the officer at the local office will both make a negative or positive recommendation and forward the application to the authority that will approve or refuse the application for rehabilitation. 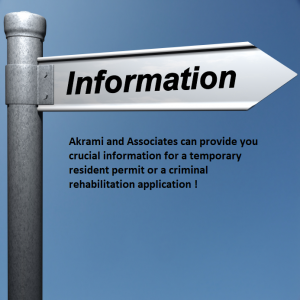 Akrami and Associates can help you prepare yourself when you arrive at the border. We can have a package ready for you that you have to present to the Officer and guide you through the process whereby you are able to confidently answer all queries in a convincing manner. We will draft the necessary application forms. Prepare supporting documents that are required to be submitted with your application. If necessary, prepare you for an interview. Follow up with Citizenship and Immigration Canada, to ensure processing times are no longer then advertised and will find out what your status of application is. We will be there on every step of the way; our endeavour will be to help you achieve your immigration goals. Call us today at 416-477-2545 or our toll free number at 1-877-820-7121 and one of our immigration representatives will be happy to assist you. You can also email us at info@thevisa.ca for general inquiries. With Akrami and Associates there is always a way! !